Islington took Bob the cat and his sidekick James very much into their hearts, when the pair were down on their luck, and used to busk outside Angel tube station. The Islington Tribune published a story about them, seen by a literary agent, who helped arrange the book deal for A Street Cat Named Bob – which went on to be a best seller. More than one million copies were sold in the UK, it’s been translated into 30 languages and it spent 76 weeks at the top of The Sunday Times bestseller list. As James Bowen says, the love of the stray cat he named Bob, helped him to turn his life around, dealing with his heroin addiction, and helping him out of homelessness. The heartwarming story has now been turned into a film, which pays tribute to Islington. Shot between October and December last year, the production even made a donation to local group Angel.London, by way of thanks. Bob and James have come so far, that Princess Kate herself will be attending the film launch on Thursday to support her charity Action on Addiction. Take a look at the trailer here. Olivier-award winning Luke Treadaway plays James. But Bob? Well, it turned out Bob played himself better than any of the stunt doubles casted – so he appears in many of the scenes. At Angel tube station a woman asks James if she can buy Bob the cat. But a dog comes along and scares Bob. 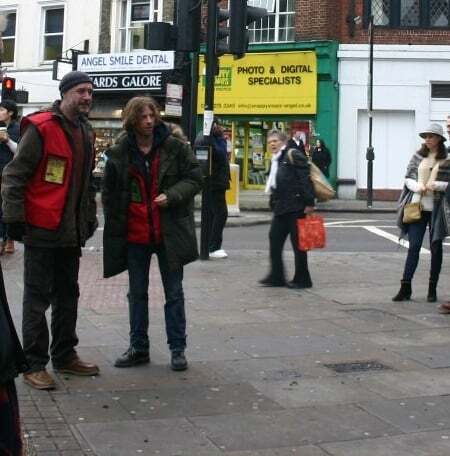 Locals will recognise Bob being chased through Camden Passage, and along Islington High Street. We see James frantically looking for Bob in Camden Walk, and among the bushes in Islington Green. On the corner of Liverpool Road and Upper Street, James chats to American tourists. And at Angel, of course, a journalist from the “Islington Times” comes along to interview James. In Lambeth, we see the pair busking outside the IMAX cinema, and Bob wheeling around in the front basket of a bicycle along Mitre Road. Outside St John the Evangelist Church on Waterloo Road, we see a soup kitchen. And a building on Wandsworth Road in Vauxhall plays The Big Issue office.